How does the ocean affect the chemistry of the atmosphere? How does weather affect the land? Why do we have earthquakes? Alex Semple is excited about the questions that earth and ocean sciences can answer. 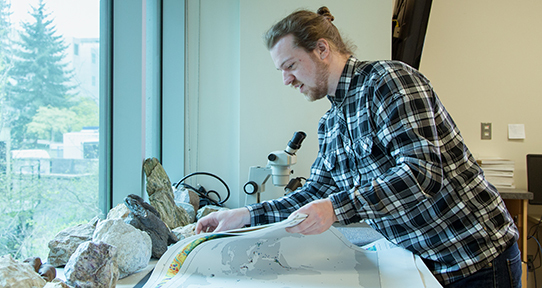 The School of Earth and Ocean Sciences offers honours and major degrees. Given our interdisciplinary nature, we also have a number of joint degrees offered with other departments. All of these degree programs offer a mix of fundamental learning and practical laboratory and field work. Relevant work experience is offered in the co-op program and via work study and summer research assistant positions. Our programs are described in the UVic Calendar. Worksheets for Program Planning are available from Academic Advising. Our graduates who pursue a degree in Earth Sciences often wish to become Professional Geoscientists (P.Geo.) through Engineers and Geoscientists BC. Consideration for registration in Faculty of Science credit courses at UVic requires that you first meet a specific set of admission requirements. The requirements which apply depend on your level of education and/or the province (or country) from which you graduated. Visit Admission Services for information about current undergraduate admission requirements.